Doesn’t work with the new facebook site and latest adblock and firefox at the moment. It picks up the hits in adblock but it doesn’t block it. It DOES work on the intro page, put on the main profile page it’s still there. Eh, the filter line got distorted after I posted it. So, do this instead: change “ego_section” in the blog post to “ego_unit_container”. Any tips for disabling it on iPad Air. 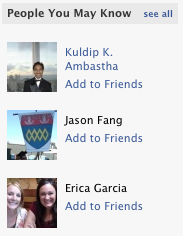 I hate “People you may know[pymk]” I tried putting X besides each person as suggested by FBook. All that happened is that I got replies from several of them accepting me as a friend. Blah. FBook Help says I can filter pymk but I can’t find where to do that. I figured I’d filter them out of existence. I absultely do NOT like fb inundating my homepage with People You May Know captions. Please stop doing it to me on facebook.